In a previous post, we introduced the AWS Mobile SDK v2.6.0 for Android and implemented user sign-in and sign-up with IdentityManager. IdentityManager is a new capability in the AWS Mobile SDK that provides a native graphical interface for authentication. We also showed how to add basic session analytics using Amazon Pinpoint. We want to show how to track user sign-in information within Amazon Pinpoint. Specifically, Amazon Pinpoint has a “Users” tab on the Analytics page. 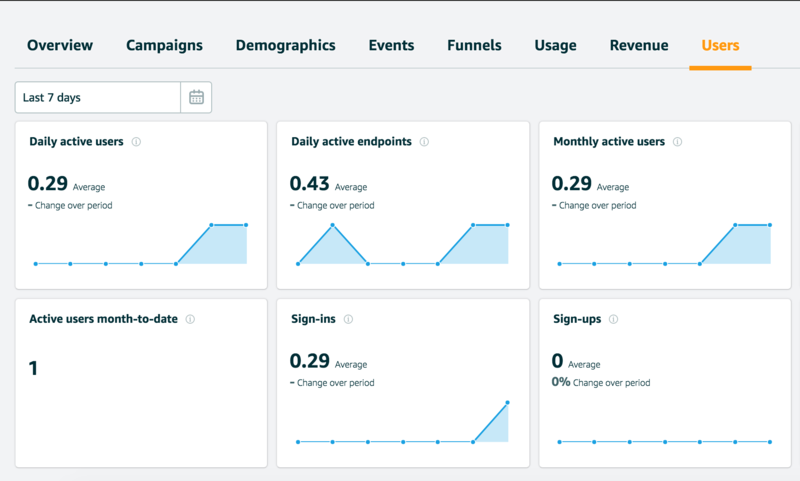 You can fill in the user sign-in and daily active users graphs to better track your users. This enables you to get more granular about your user usage. We show how to find out when users actually use the app – not merely when they start the app. Update the endpoint profile so that the user ID is specified. Send a sign-in custom event to record the sign-in. After these are implemented, go to the Amazon Pinpoint console. Select your project, choose Analytics, and finally choose the Users tab. The Sign-ins chart is driven by the _userauth.sign_in event. If you have not included the update to EndpointProfile, then you will see a change in the Sign-ins chart, but no change in the Daily active users chart. The daily active users value only increases if you send an event after you change EndpointProfile to include the user ID. Amazon Pinpoint is an incredibly powerful mobile analytics and engagement solution. For more information about the Amazon Pinpoint solution, see the Amazon Pinpoint Developer Guide. You can also review the Android topic in the Amazon Pinpoint Developer Guide and the AWS Mobile SDK for Android Developer Guide.